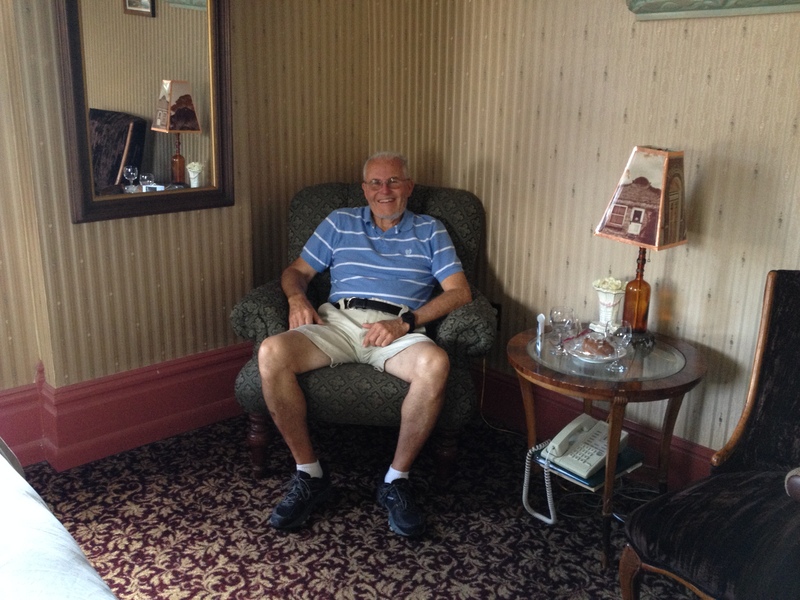 For our forty-sixth anniversary, Craig and I went to Jerome, Arizona for a night’s stay in the Connor Hotel. We had been advised that room 12 was their most popular room, so we requested it. It is decorated with antique furniture and a wonderfully comfortable king-sized bed. We found a cold bottle of champagne and a spice cake waiting for us in our room as an anniversary gift from the hotel. Labeling a place a ghost town sparks the imagination and tends to make one’s mind susceptible to the powers of suggestion. Still, most of the residents of Jerome and many of its visitors have their own scary stories to tell. 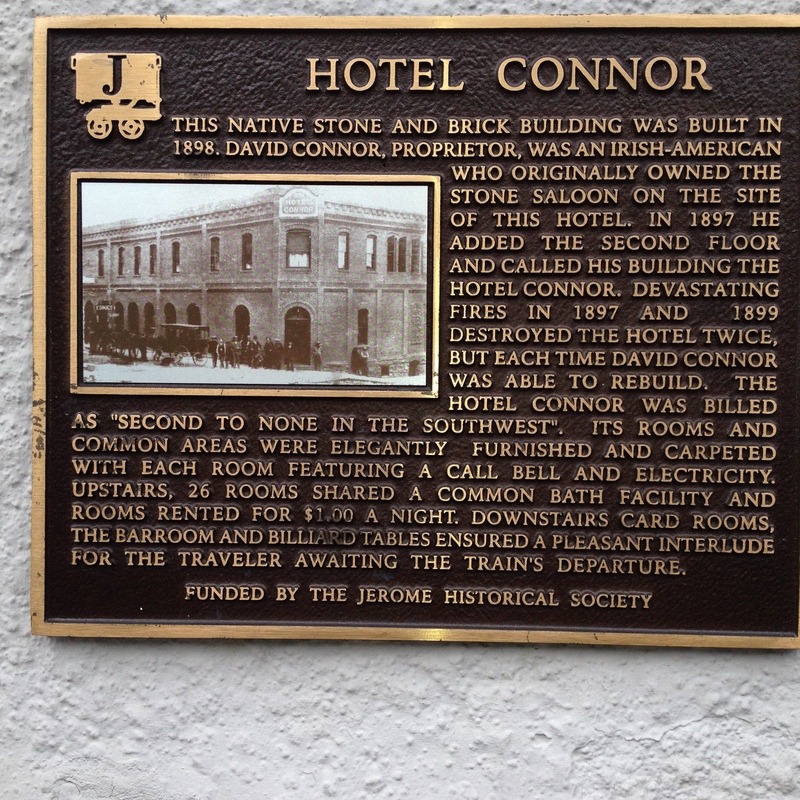 The Hotel Connor, for example, is said to be Haunted by Mr. Connor, the original owner. There are stories of people hearing laughter, parties, and things moving around. Craig and I did not encounter any spirits I’m happy to say, but we did have an experience that left me wondering. After spending the night in our hotel room, we were getting ready to go for breakfast. All dressed, Craig was still without his shoes. I searched the room from top to bottom–even in unusual places like the microwave and refrigerator. I looked again and again in the closet, under the bed and under all the furniture. There were two large chairs in the room. After looking under them many times, I picked up each chair and moved it–still no shoes. Not sure what to do next, I was in the bathroom when I said, “Maybe a ghost got them.” I walked back in the room and there they were under the chair–the same chair where Craig is sitting in the picture above. After breakfast, we went on a walking tour of Jerome. When I related the story of the missing shoes to our guide, he said, “I know which room you were in.” Then he told us about a man who put his wallet on a night stand. When he was ready to leave, his wallet was missing. After looking for it everywhere, he finally found it under a chair. Apparently ghosts like to play tricks on people. Maybe it’s just their way of making themselves known. I’m still not sure I believe in ghosts, but it was enough to make me keep an open mind.